The Midnight Review: Sarah Palin Huffs and Puffs Over Joe McGinniss' New Book "The Rogue"
Sarah Palin Huffs and Puffs Over Joe McGinniss' New Book "The Rogue"
It didn't take long for Sarah Palin and her camp to weigh in on the controversies stated in the Joe McGinniss book. While Palin herself has not come out to denounce the book, people close to her have already attacked the book. For instance, Palin's husband, Todd, said the book contained "disgusting lies." Now, Palin's lawyers are stepping into the game serving a notice of possible litigation - not an actual lawsuit - and the letter from Palin's lawyers to the publisher of McGinniss' book, Crown Publishing, a division of Random House, is full of the kind of ridiculous nonsense expected of Palin. Enclosed is an e-mail by your author Joe McGinniss. In this e-mail, Mr. McGinniss admits that your own lawyers instructed him that “nothing I can cite other than my own reporting rises above the level of tawdry gossip.”….Indeed, Mr. McGinniss admits that the allegations are false unless he can find someone or something to show they are true. We know from the final book that he was unable to do so. Accordingly, since both your company, and the author, clearly knew the statements were false, admitted they had no basis in fact or reality, but decided to publish in order to harm Governor Palin’s family, you and Mr. McGinniss have defamed the Palins. This letter shall serve as written notice under AS.09.30.070 (b) that a claim may be brought against you, your company and Mr. McGinniss for knowingly publishing false statements. In the interim, please take note of the following: It is unlawful to delete emails or destroy records upon being notified of the need of business records for litigation purposes. In addition, courts may impose civil sanctions against a defendant that destroys emails and other documentation. Please immediately provide notice to your employees to save and back up all records pertaining to the Palins and the book “The Rogue." Further, as Mr. McGinniss waived the attorney client privilege and disclosed to third parties what "Random House lawyers" told him (he needed sources and the book was not publishable without them), we will also be entitled to review your company's legal correspondence with Mr. McGinniss and his responses thereto. Please do not hesitate to call if you have any questions or concerns or if you wish to resolve this dispute. What is interesting about this note? Everything. 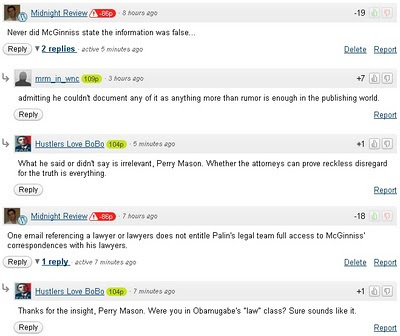 First, Palin's lawyer John Tiemessen attacks Joe McGinniss' "anonymous" sources and claims that McGinniss admits the information in his book was false. McGinniss had never admitted doing anything wrong as Tiemessen claimed. Secondly, it is funny to think that Tiemessen actually believes that one disclosed email where McGinniss references "Random House lawyers" somehow waives McGinniss' entire attorney client privileges. Referencing communication to your lawyer does not somehow entitle an opposing party to view your correspondences. I guess that since Tiemessen released this letter stating the information in McGinniss' book is false, he must have had communication with Sarah Palin proving the book contains false and malicious information and therefore Joe McGinniss is entitled to see the evidence Palin and her lawyer have and all correspondences regarding such issues. The last sentence is also laugh-worthy. Tiemessen actually had the nerve to put in his little note that Crown Publishing should not hesitate if they wish to resolve this dispute. What is funny about that last line is that there would be only one way to solve this situation should Tiemessen's claims were to be true and that would be to sue Crown Publishing and demand the book be pulled from the shelves but instead Tiemessen only raises the specter of litigation and tries to gain access to McGinniss' confidential information. It appears that Palin's team is trying to find out any weak links in McGinniss' chain so that they can exploit them for a Palin victory. If Palin had proof that McGinniss was presenting false information in his book, Palin could simply come forth with evidence of the truth and easily win a case against the publishers. For instance, McGinniss raises some interesting questions regarding the birth of Palin's son Trig. Palin could easily release Trig's birth certificate and her medical records to dispel what Tiemessen calls "false statements." Tiemessen wrote that "Mr. McGinniss admits that the allegations are false unless he can find someone or something to show they are true." How is that not true for Tiemessen and his client? 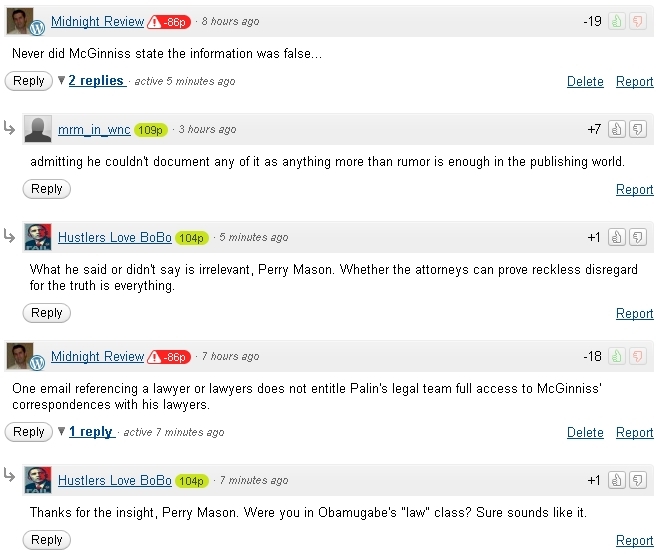 Palin's claims are false unless she can find someone or something to show they are true, such as a birth certificate. It is highly unlikely that Palin will pursue a legal course of action because doing so would require Palin to be deposed, and since we all know Palin to be a habitual liar, a deposition would but the former half-term governor of Alaska at risk of perjury. Notice how one commenter, Hustlers Love BoBo, chose his name to insult other commenter (and Midnight Review regular) HuskersLoveBo? Also notice how even presenting a logical statement, such as one email does not throw away McGinniss' attorney client privilege, is confronted with insults and zero facts supporting why they believe Palin's lawyer to be in the right. I won't hold my breath waiting for Big Government to delete these flaming comments and reign in their violent fans. 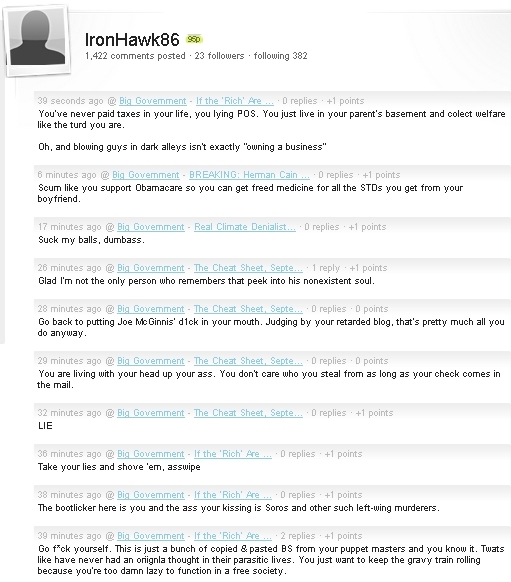 Sounds like IronHawk86 is a really mature individual. Seems like his insults on Big Government aren't a real stretch - he loves to call people "shitstain," "asslicker," and "cocksucker" on other sites, too. 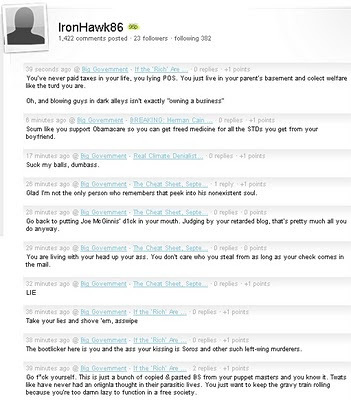 Based on his comments, IronHawk86 is either just a stupid and ignorant pawn influenced by right-wing media or he is a sheltered 25-year-old rich boy who doesn't want daddy taxed so he can inherit it all. I don't think that this letter was anything more than the usual Palin manipulation of the media. A lot of people will read the completely uncritical MSM reports on this, say "so they threatened the publishers. They must have proof of lying. ", and then forget about it. As a matter of fact, Palin's worshipers are already pushing this meme HARD in the Internets. The fact that this "cease and desist" letter doesn't give even ONE example of something to "cease" either makes Palin's lawyers morons, or means that they have nothing to complain about. And there are no specifics. It's as of the lawyer asked Sarah to point out lies in the book and she said, "any of them, all of them." That's obviously false, as is the assertion that she is "Governor Sarah Palin." Just a way to stir up her bots to send more money to poor millionaire many times over ex-half-Governor Sarah Palin. This pretend lawsuit will sell even more copies of the book, as that email from 8 moths before publication just proves that McGinness was determined to write the truth. The clock is ticking. The statute of limitations for libel ranges from 1 to 3 years through each of the states. It is interesting because there is no need for Palin's lawyers to tell them to not delete their emails or whatever. If the info was false then she would could file a suit right away and present any evidence proving it is false, but since she can't she is trying to get a hold of McGinniss' personal emails so she can try and damage his reputation. Also, didn't Palin destroy records (delete emails, etc.) before she left office? I had also noticed a lot of bashing of Joe McGinniss on right-wing websites for being some sort of super liberal author. Would a super liberal author write a salacious biography of Ted Kennedy? Yes, BoBo's name is a lame attempt to mock me. I could not care less. There are very, very few persons on these sites with a brain. Most of them are into conspiracy theories or post outright falsehoods citing as authority other wingnut sites. When they run out of something which resembles an intelligent remark, they resort to name calling. I go on their sites and do not back down one inch. Thank you for your site, Kevin.